Whenever Jesus speaks in the gospels, he does so with courage and confidence. He does not change or alter his message for anyone. He comes with a radically new message, which for some is very hard to hear never mind accept or believe. He then turns to his own friends and asks them if they too want to leave him. 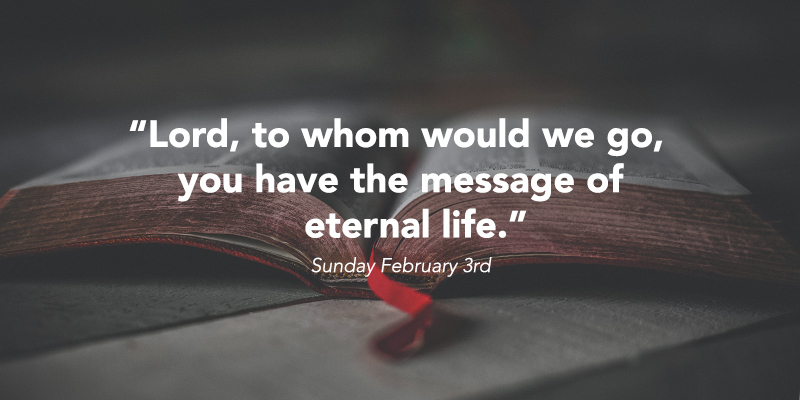 They answer, ‘Lord, to whom would we go, you have the message of eternal life.’ The word and message that Jesus brings and offers us is not for the faint hearted! In the gospel this Sunday, Jesus has just finished reading from the Sacred Jewish Scriptures where it is written, ‘The Spirit of the Lord has been given to me, I have been sent to bring the Good News to the Poor.’ To claim to be anointed by the Lord, Jesus is claiming to be God’s chosen One, the Messiah. The he tells those who are listening to him, ‘This text is being fulfilled today, even as you listen.’ Initially everyone is impressed and amazed at the words that came from his lips. But then everything changes; Jesus challenges them even more and then they turn on him. They take him down a peg or two; they remind him he only the local carpenter’s son. Who does he think he is? Jesus doesn’t change his message to suit them; he tells them that a prophet is never welcome in his own country. Then he reminds them that in the Old Testament when a famine swept the land, the only person healed was the Gentile leper Naaman. This is simply too much for them! They grab him, bring him to the top of hill with the intention of throwing him from it, but he escapes! They had their own idea and expectation of Jesus and who he was, which suited them as long he didn’t challenge or disturb them. But Jesus speaks and behaves in a way that is completely unexpected by those who think they know him best. Instead of being open and listening to Jesus and changing their own ideas about him, they try to silence and then kill him. And, as we know, this will happened eventually when they crucify him. What are our own images and ideas about Jesus today? Do we keep Jesus at a safe, silent and comfortable distance in case he says something that challenges and upsets us? When Mary heard that she was to be the Mother of Jesus, we are told that ‘she was deeply disturbed by what she heard and wondered what these words could mean.’ The word of God that we hear through the scriptures is alive and active; it is not history. The Word of God is meant to encourage and nourish us; it also meant to challenge and disturb us.